In the Marawi, Philippines an Isis flag has been raised as both a brutal and intense battle rage below it. The city is primarily made up of Muslim people and is located in the Southern part of the Philippines. The government is dealing with the situation as best as it can using military force. The incident that has gone on for at least a week. It is said that the Isis leader for the Philippines somehow managed to unify a violent militant group and they’re currently under one form of a command. The incident has really has shown how strong these fighters seem to be despite the rather large scale assault from the Philippine military. It must also be mentioned that the ideology of Isis is by no means moderate and is gaining a foothold in the southern part of the Philippines. There has also been a Muslim separatist rebellion that has gone on for decades. 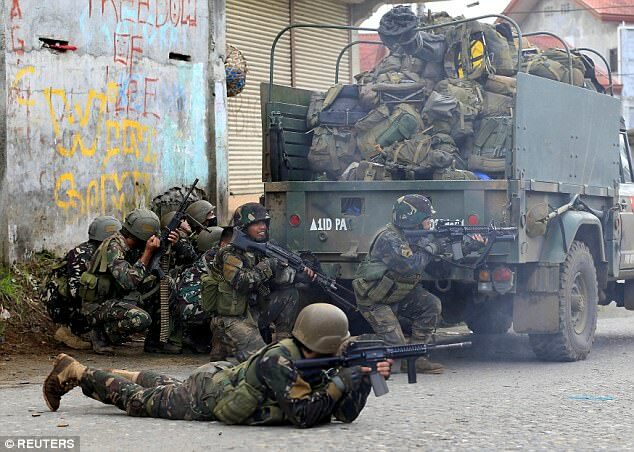 On the other hand, the Philippine military insists that the drawn out fight does not show how strong these fighters are but rather that the military is not using its full force because it is concerned with civilian lives. Even Gen. Eduardo Ano said “They are Weak, and “It’s just a matter of time for us to remove them from all their hiding places.” He was speaking at a hospital where wounded soldiers were being treated for their wounds. Military attack helicopters were flying low on Monday, as they destroyed militant position in the city. At the same time, heavily armed soldiers went from house to house in search of the militants. For just under a week, the gunman has held the Philippine army at bay and they’ve been burning buildings and went as far as to take at least a dozen innocent people hostage. Officials say the Islamic militant's commander, Isnilon Hapilon, is one of Washington’s most wanted militants and he is still hiding somewhere in the city. This terrible ordeal has caused thousands of citizens fleeing for both their safety and their lives. The President of the Philippines Rodrigo Duterte decided to declare martial law for 60 days in the south last week. This happened just after a raid to capture Hamilton went wrong and caused militant fighters to go on a rampage in the city. However, you must keep in mind that over the past few years small groups of militants have emerged in the Philippines, Indonesia, Malaysia and have begun unifying the Isis flag and symbols. One local resident said that Maute militants flew an Isis flag in one fo the city’s mosques. The local would only talk under the condition of anonymity, as he was and is fearing for his safety. He even said that the militants pressured local Muslim preachers and made them not speak out against them. As Isis loses ground in Iraq and Syria some fighters are coming to places such as the Philippines and are bringing their radical way of thinking about them. However, the fighter’s support network is currently unknown but it is known that they may have little local support due to the intense fighting and oppressive way Isis holds onto any form of power.